Our Marcellin community provides many opportunities for our boys to extend themselves, whether it be within the school or out in the broader world. 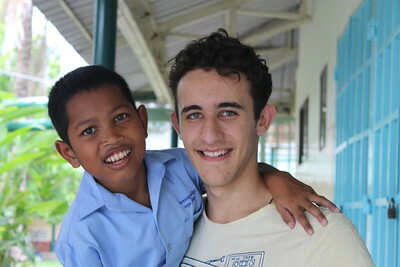 One initiative is the Cambodian Immersion Program which has been running for the last 5 years. Here, a small group of students are given the chance to visit the Pailin Community of Marist Brothers and to work in solidarity with both communities. This year we have a group of ten year 11 boys accompanied by 3 members of staff. This group has been busy fundraising and they have also collected 12 boxes of items to take with them such as toothbrushes, toothpaste, clothing and books. The Old Collegians Football Club has very generously donated a cheque, as has our own MCCA. See photo here. This trip will take place annually and the teachers in charge are hopeful that our generous Marcellin community will support the aims of the program either financially or by the donation of goods the group can take with them. The association with the Pailin community will be an enduring one and the legacy from this to both that community and the Marcellin boys and their teachers is a valuable asset to our whole College. Take a look at some photos of boys from previous years working hard at the local school preparing classrooms, playing soccer with the children and becoming a part of the community. This year's pilgrims will be undertaking the concreting of at least two classrooms while they are there.